Girl with a Pearl Earring is an oil painting by 17th-century Dutch painter Johannes Vermeer. In 2014, Dutch astrophysicist Vincent Icke raised doubts about the material of the earring and argued that it looks more like polished tin than pearl on the grounds of the specular reflection, the pear shape and the large size of the earring. More than two hundred years passed between the painting’s creation and its sale at auction in 1881. There, Dutch Army officer and art collector Arnoldus Andries des Tombe purchased Girl with a Pearl Earring for just 2 guilders with a 30-cent premium. Upon des Tombe’s death in the winter of 1902, the work was willed to The Hague’s art museum the Mauritshuis, where it can still be seen today. In recent years, The Mauritshuis loaned Girl with a Pearl Earring to Japan, Italy and the United States for exhibitions. But once this tour concluded in July of 2014, the museum announced the painting would stay in their collection within their walls indefinitely. And so Girl with a Pearl Earring joined the ranks of Botticelli’s Birth of Venus, Picasso’s Guernica, and Les Demoiselles d’Avignon as works sworn to stay safe in their home museums for all time. 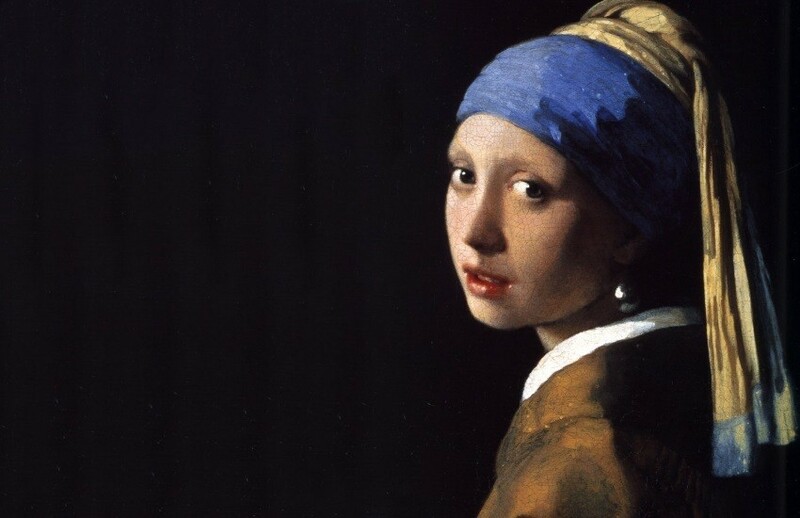 All titled Girl with a Pearl Earring, these works began with American novelist Tracy Chevalier, whose 1999 historical novel spun a love story between Vermeer and a servant girl turned muse. In 2004, Chevalier’s book was adapted into an acclaimed feature film, starring Scarlett Johansson and Colin Firth. Then in 2008, a stage adaptation was produced in London. The girl in this painting is believed to be Vermeer’s eldest daughter, Maria, who was about twelve or thirteen years old at the time it was created. Regarded as Vermeer’s masterpiece, this canvas is often referred to as the Mona Lisa of the North or the Dutch Mona Lisa. Girl with a Pearl Earring is one of over forty images of women created by Vermeer and thus it is obvious that he had a keen interest in women’s socio-cultural roles. The painting has been in the collection of the Mauritshuis in The Hague since 1902.